Replies: 156 (Who? ), Viewed: 128518 times. Back on the 2nd May 2004, when I first set up the CMS system that would become MTS2, little did I know that, 4 years later, the site would still be going strong, with millions of members joined, tens of thousands of people on per day, hundreds of thousands of items downloaded a month. During the last 4 years we've seen a lot of changes around here. Many people have left, lots of new ones have joined, and stars have risen and fallen again. We've had 1,941,679 members registered. And almost 1.3 million pruned for inactivity. We've had at least 59,413 downloads posted on the site, including the very first one (which doesn't work anymore...), this one: http://www.modthesims.info/showthread.php?t=30401. (If you are wondering the reason it starts at 30,401 is becuase I had to write a custom script to import e107 threads to vBulletin in Sept/Oct 2004, and didn't reset the auto_increment values). We've been through at least 3 major download overhauls, one complete software change (e107 -> vBulletin), a heck of a lot of tweaks, improvements and modifications, and seen people leave to setup thier own sites. Of course, it's not been without the drama too, but I feel that at this point in it's history, what the site stands for and has become is far more important that all of that. So, I would like to thank all of the staff - current and past - all of the creators - featured, picked or just people who want to share things, all of the people who say thanks, or even just click the thanks button and above all, you for visiting and reading this. With the Sims 3 only a year or so away, this site is still going strong - over 40 million pageviews a month still, and some 16 million downloads. There is still a lot of life left here, and I wish you all the best of luck for another year. Last edited by Delphy : 2nd May 2008 at 11:10 PM. 51 users say thanks for this. Well done. This is still the best source for Sims 2 downloads on the web, even at the ripe old age of 4. How old is that in interweb years, I wonder? Happy Birthday! Thanks to all staff and members for keeping this site alive. thank you Delphy for informing us and thank you for still being around here even if I think you are mts2 father so how can you ignore it! And a big thanks to Delphy and the rest of the staff, for creating and running such an awesome site! Thanks to all that keeps this site open and going. This site has made my game play more enjoyable and I can customize all my home because of all the things each of you does. Happy Birthday MTS2! And a Big thumbs-up to all the staff! 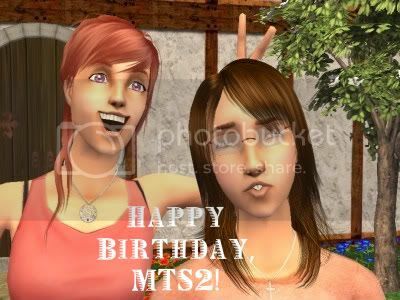 Happy birthday, MTS2! Congrats to Delphy and the whole crew! I have been here since last summer and I love downloading things here! Happy Birthday, MTS2! Do we get to eat sausages now?? And when that day comes she'll be waking up next to the boy who already knew.